In the past couple of years, there has been a significant increase in contactless payments around the world. It’s not only that customers are paying with contactless like never before but also that banks are investing in their contactless payment propositions. At Mapa, we have seen plenty of new initiatives in both our Payments and Mobile Wallet report and in our Mobile Banking Dashboard; new Mobile Wallets, improvements to existing ones, a new device introduced to Barclaycard’s bPay range. There is an increasing preference for digital payments over cash. As the market for mobile wallets and wearables is forming, contactless technology plays an important role in the continued progress of digital payments. Unfortunately, the success of contactless payments has not reached all markets. The US has been struggling to keep up with the rest of the world. In May this year, Visa Europe announced that contactless payments in Europe had passed a significant milestone: three billion transactions had been made over 12 months, nearly tripling the figures from the previous year. The UK is one of the leading European countries in terms of contactless usage rates. Between April 2015 and April 2016, contactless adoption grew by 300%, from 51 million to 153 million transactions. An important factor to its success in Britain has been attributed to the London transport system, Tfl, who have introduced and incentivised commuters to use “tap and pay” to quickly pay for fares. Since the launch in 2012, more than 300 million journeys have been made in London using credit or debit cards or mobile technology. Europe is not the only area embracing contactless payments. In the Asia Pacific region, 74% of cards shipped in 2015 featured contactless technologies. In Australia, MasterCard has confirmed that their contactless transactions have increased by 148% between 2013 and 2014. Furthermore, 65% of Visa Australia’s face-to-face transactions are contactless. In China, $8 billion worth of contactless mobile payments were made in 2014 and last year 90% of all new cards were contactless-enabled last year. In Canada, the government has made a commitment to create a cashless society. Last year, nearly a quarter of all in-store Visa transactions were made with contactless payments, whilst for MasterCard the respective figure was 27%. In light of the wide contactless acceptance in the rest of the world, it is surprising that the US has fallen behind. The main reason is that there is little perceived value in choosing chip-and-pin over swipe-and-sign payments. This has resulted in a lack of payment terminals that accept contactless payments (EMV terminals). In 2011, Visa announced that they would migrate from cards with magnetic strips to chip cards. To enable customers to use their new chip card, retailers needed to upgrade their payment terminals to EMV terminals, the majority of which only accepted magnetic stripe cards. But this migration of payment terminals was met with resistance from retailers. Mark Horwedel, CEO of the Merchant Advisory Group, told online newspaper CSO: “This is the most complicated and most costly point-of-sale (POS) project that’s ever been foisted on merchants. They’re making us pay for 75% of the conversion.” While the change is driven by card companies, the majority of the cost will be absorbed by retailers. It doesn’t help that American card holders are apparently happy with their magnetic stripe cards: there has been little pressure from customers for businesses to uproot their current processes. As a result, most retailers ignored the official EMV deadline, which was set to October 2015. Note that this was not a regulatory requirement, although it did mark a shift in liability when it comes to fraudulent activity. 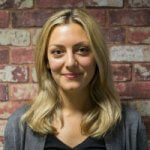 Whichever party – card issuer or retailer – has the “lesser” technology is now liable. The statistics from the official body for EMV standards, EMVCo, tell a sad tale of the failure to migrate retailers to the new EMV terminals. 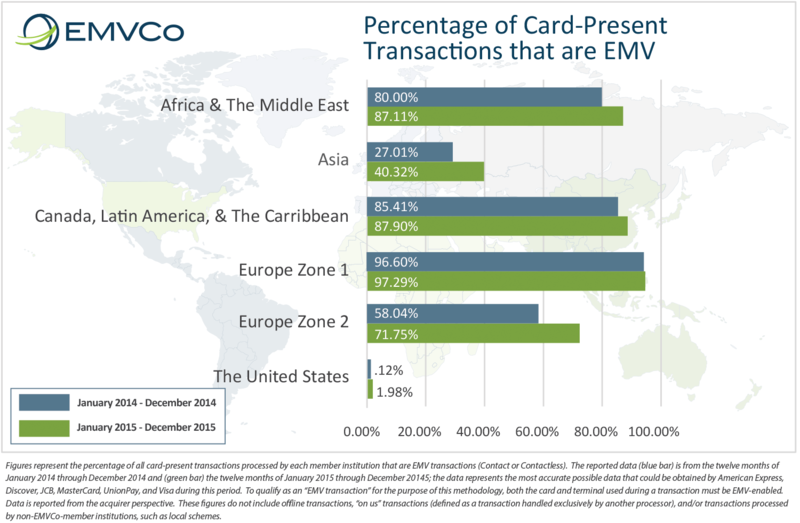 The proportion of transactions made via EMV last year in the US was only 1.98%. Note however, that transactions on EMV terminals can be made with chip-and-sign or contactless. This means that the percentage of contactless payments made was probably less than 1.98%. “To overcome these hurdles, US financial providers will need to demonstrate to retailers, and their customers, the upsides that contactless can bring – including heading off any consumer security concerns, and showing retailers that their investment will pay off in the long run through faster transactions and increased throughput”, says Stanaway. There are some suggestions that banks need to team up with retailers to offer incentives like cashback to encourage contactless adoption. Chase has actually made an attempt to do this through their “Chase Pay” solution but, like attempts to introduce contactless in some subway and metro systems across the US, it’s very early days. It’s clear that customers who have the option of paying with contactless see the value in it. Its usage will continue to increase as markets make advances towards becoming cashless. In particular, we expect to see the use of contactless payments on mobile and wearable devices grow in the near future. But whether the US will keep up with the pace of development of digital payments remains to be seen. For more on digital payments, our Insight Series – Payments and Mobile Wallets report is out now. To find out more about the most exciting innovations and trends in the mobile banking space, have a look at Mapa’s Mobile Banking Dashboard. Or, contact us to see how we can support your digital strategies.